When my son told me what he would like to be for Halloween, my three year old daughter piped up with “I want to be a Happy Dolphin”. She made it a point to make sure I heard the Happy part; she could not be just any old dolphin, she had to be a Happy Dolphin. She wanted to be blue with a white underbelly, big eyes and a big smile. 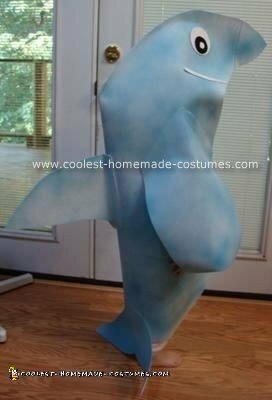 This is how I made her Homemade Dolphin Costume. I grabbed some foam, foam glue, spray paint, etc. and began creating a happy dolphin for my young daughter. She is not at all fond of anything that covers her face or that goes over her head and makes her feel trapped and/ or like she can not breath; so I made her costume accordingly. I glued on a big smile and kept it big and open for her to see out of. She will wear some white clothing which will keep with the underbelly color of white. She can move freely and loves it. She will probably be wearing it for many more months. We love to wear costumes year round at our house – we have vivid imaginations and love pretend. Thank you so much for this posting! I am using this as a base for a VERY unique Halloween costume! I’m going to dress up as a guinea pig! I was wondering what kind of foam you used and where you got it :) thank you and i absolutely love it, it’s so creative!! Anyone ever find out what kind of foam this was made out of and where you can buy it? Thanks. Again, did anyone ever find out what kind of foam was used? you can buy 1/2 in thick high density foam by the yard at most fabric stores. It’s 50% off at Joann stores the rest of this week. Thin foam (car headliner) can be found at JoAnn Fabrics. Is about $15.00 per yd. but it wide. Used it to make Mrs. Potts from Beauty and the Beast. Takes paint and can iron on fabric as well. Would you consider selling it or making another one for my 4 year old?!? My 7 year old boy has requested a ‘Defin’ for Carnival. This is a good starting point! Can you please give to us the process of doing this costume step by step? Do you a video on making this costume?